Document security is one of the most important challenges faced by businesses today. 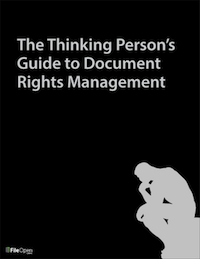 Your documents contain your company’s proprietary, confidential or regulated data and are likely the most valuable things on your computer or network. FileOpen document security and rights management software not only allows businesses to set up strict access and usage controls to documents, it also provides additional layers of security to prevent or deter the unauthorized redistribution of the data in your documents. Today we will take a look at two lesser-known features available in FileOpen software which go a step beyond basic document security; screen-capture prevention and user-identifying watermarking. For our most security conscious customers, FileOpen offers screen-capture prevention in environments where possible (currently Windows operating systems). FileOpen has obtained a Code Signing (Class 3) Digital ID giving permission to run services at the kernel level, including monitoring for a screen capture event. Once an event has been identified, our app hides the content of the protected document. 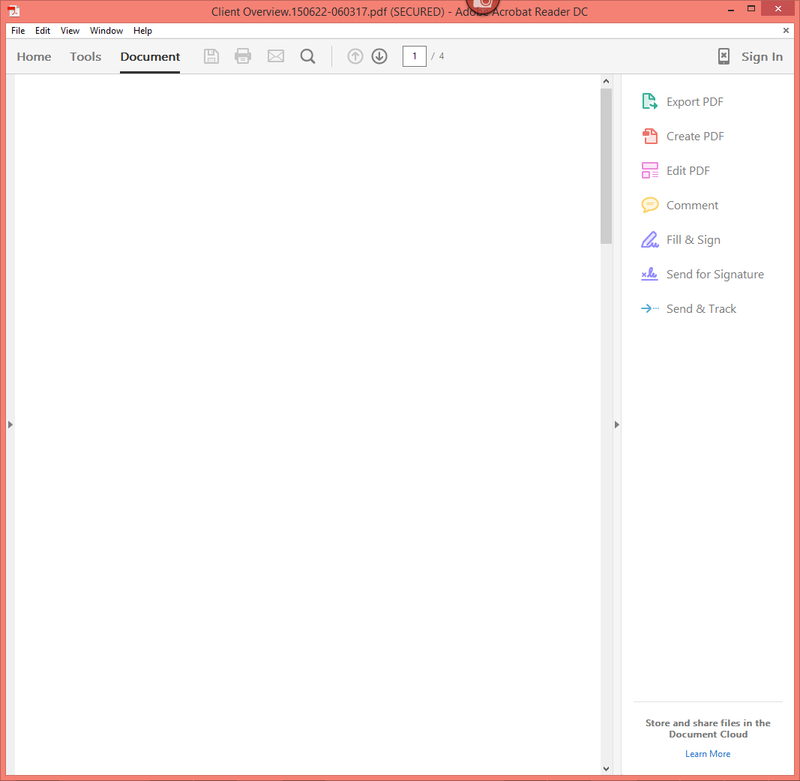 The screen shots below illustrate a FileOpen-protected document with and without screen capture prevention enabled. FileOpen-protected PDF, viewed in Adobe Acrobat/Reader DC with the FileOpen Plugin, without screen capture prevention enabled. Image captured with the Windows Snipping tool. 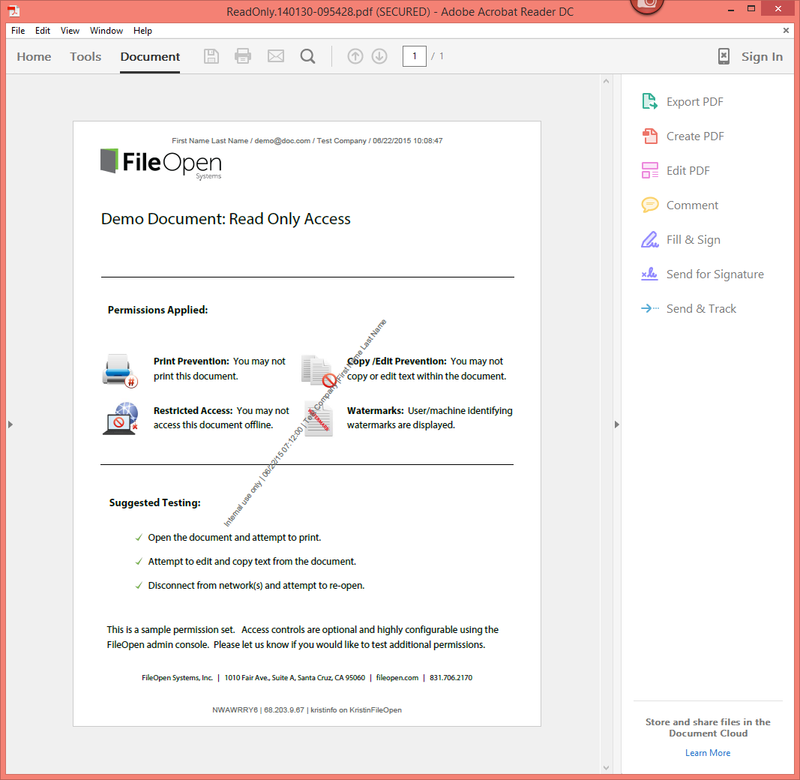 FileOpen-protected PDF, viewed in Adobe Acrobat/Reader DC with the FileOpen Plugin, with screen capture prevention enabled. Image captured with the Windows Snipping tool. To be clear, we do not claim that FileOpen guards against all methods of screen capture; it is always possible for a determined adversary to use a camera or to transcribe content manually. Nothing is 100% secure unless it is 100% unusable. That said, FileOpen screen-capture protection adds real value by preventing screenshots in environments where it can do so without impacting the recipient’s ability to use the document as intended. In addition to screen capture prevention, FileOpen enables user-identifying watermarks. Watermarks can be applied on-screen and to printed copies of protected documents (and can be different watermarks in the two cases). These watermarks provide a deterrent against a user redistributing a confidential or purchased document, because they are far less likely to disseminate content where they are identified as the source. Watermarks can be configured as needed and can be edited with immediate effect. They can contain static and variable information (for example, the recipient email address, IP address, user host name, print driver and the date and time of view/print). For this reason, different users will see the same document with different watermarks. FileOpen watermarks are supported in PDF on Windows and Macintosh, in OPN on all supported devices, and in the FileOpen HTML5 rendition. The screen shots below illustrate a FileOpen-protected document with user identifying watermarks. 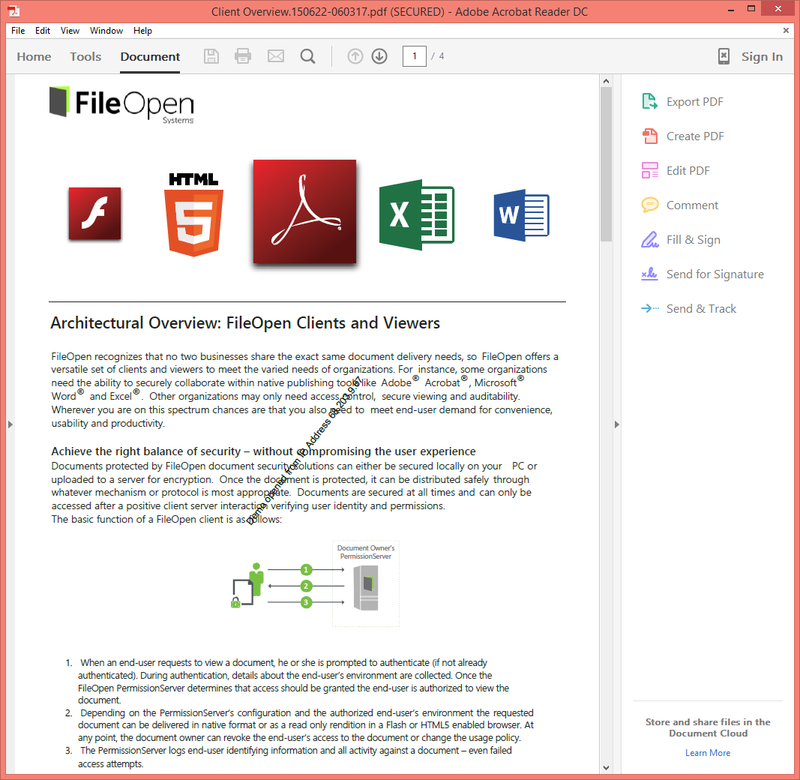 FileOpen-protected PDF, viewed in Adobe Acrobat/Reader DC with the FileOpen Plugin. Both variable and static watermarks are present. 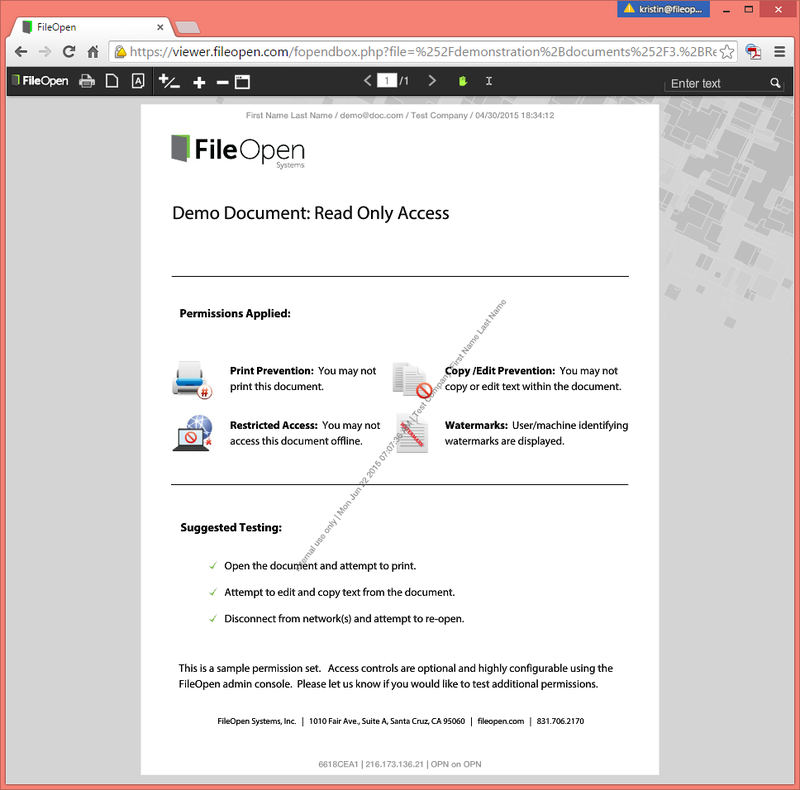 FileOpen-protected PDF delivered in OPN format, viewed in Chrome without any clients or plugins. Both variable and static watermarks are present. Contact us today to learn more about the FileOpen document security.